The Russian ruble is gaining ground against the hryvnia across rebel-held parts of East Ukraine’s Donbas region, 19 years after Kyiv introduced the national currency to end the country’s membership of the ruble zone. As Eastern Ukraine heads towards becoming a frozen conflict, the ruble is in widespread circulation after Russian-backed separatists who control the self-styled Donetsk and Luhansk People’s Republics (DPR/LNR) launched payments of pensions and salaries in the currency at the start of April. While the symbolism of the ruble’s resurgence in the east is strong, the move may reflect as much economic necessity, as well as a political desire to integrate with Russia, after Ukraine severed financial ties. Cash-strapped and wracked by conflict, Kyiv excluded rebel-held territories from the national payment and banking system, making it impossible for pensions and state salaries to be paid out. It also introduced controls on traffic and passage to and from the disputed areas, leading to a shortage of food products. Meanwhile, supplies of hryvnia cash are also dwindling. Introducing the ruble as legal tender will also facilitate secret direct funding of the self-proclaimed DPR and LPR by Moscow, say analysts. Moscow denies sponsoring the Donbas rebels, who claim the ruble influx is caused by tax revenues from local exporters, and locals who left in large numbers to work in Russia and send money home. Officials were quoted in the local press as saying that the total sum of ruble payments made by the DPR in April was RUB1.9bn ($30mn). Galina Sagaidakova, head of the rebels’ ‘DPR Pension Fund’, told bne IntelliNews that the shift to the ruble was a pragmatic decision. “We began to pay out pensions in rubles from April 4, after the decree from the head of the republic March 25, 2015. We pay out according to the pension law, simply multiplied by two because we’re paying out in Russian rubles,” Sagaidakova said. Sagaidakova emphasised that the DPR is paying Ukrainian pensions, not Russian. “In truth the pensions should be paid out by Ukraine, even the ones that we’re paying out now,” she said. According to Sagaidakova, the reason pensions are being paid in rubles is simply that “we’re paying out in the currency that we have because we get money in rubles.” The rubles in turn are coming from the DPR, she said, declining to say where the DPR was receiving ruble funds. Sagaidakova said that the DPR pension fund even exchanges information with Ukraine’s state pension fund. “Until recently it was a one-way correspondence, we were notifying them, but I think in due time this is going to work, because the Ukrainian pension fund also began to contact us and request the files,” she told bne IntelliNews. Shops now display prices in rubles and hryvnia, and many have set up cash desks for rubles. With many of those remaining in the rebel-held territories pensioners, the sudden flow of rubles starting on April 4 has caused rubles to appear in circulation very quickly, on a par with the hryvnia. Initially DPR officials spoke of allowing dollars and euros alongside ruble and hryvnia, but there is no evidence of pricing in, or circulation of, euros or dollar. Payment of pensions by the rebel authorities is still only partial. According to government announcements posted in Donetsk announcing the advent of DPR pensions, “no pensions will be paid to those who have applied to receive pensions in Ukraine”. Pensions are paid out at the ‘Central Republican Bank,’ which comprises former branches of Ukraine’s state-owned banks on the rebel-held territories, now commandeered by the rebels. Since many local pensioners still hope to get payment for arrears on Ukrainian pensions, they were wary about talking about their receipt of ruble pensions in DPR. “I got 1,000 rubles in aid payment because of the pensions I have missed, and then my pension for April, in rubles at a rate of 2 rubles to the hryvnia,” said Tanya, an 80-year-old resident of Donetsk city center, who declined to give her last name in case she loses pension entitlement in Ukraine. Despite receiving her pension, she was standing in line for humanitarian aid provided by local oligarch Rinat Akhmetov. Not only pensions, but also salaries to state employees are increasngly being paid in rubles. “We started to receive salaries [in rubles] recently,” said a librarian at the district library on Tchemoskinov street, requesting not to be named. “For seven months we received nothing,” she said, adding that she also received three months back salary paid by the DPR along with the April salary. “We’re all law-abiding citizens, first of all we paid off the rent and the utility bills. We paid that to the DPR,” she said. “It’s not enough [money] but that’s how we live now. Those who survived the 90s have some experience,” she said. “In the last month we got paid in rubles,” said Artem Neizvestny, a 43-year-old park worker. “We spend it on food and clothes, we’re not exactly happy, but it sort of works,” he said. “Of course using rubles makes me think we’re more part of Russia, but prices here remain Ukrainian,” said 30-year-old Nastya Golodets, the employee of an international hotel chain in Donetsk, who had also worked in Moscow for a number of years. Nastya said she had savings in rubles, and her mother received a pension payment for April in rubles, while because of hotel closure she received a third of her former salary paid in hryvnia. Increasing use of the ruble symbolises the rebel-held territories’ slow drift towards Moscow, and may also accelerate the drift. 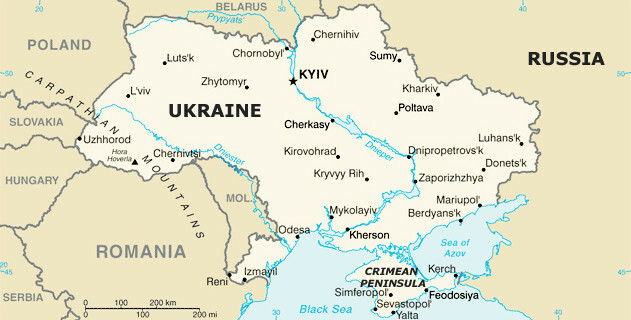 With Kyiv alleged by locals to have introduced a de facto blockade of the rebel-held territories, food products may now be easier to source across the border, while exports of coal to Russia are growing, according to recent reports by OSCE monitors on the Russia-Ukraine border. Kyiv-appointed governor of Donetsk Oleksandr Kikhtenko, in a newspaper interview on April 10, said that Kyiv should restore economic relations with the rebel-held territories, in order to reintegrate them in Ukraine. But Ukraine’s interior minister Arsen Avakov furiously rejected the idea. “I call to break off Kikhtenko’s economic relationship with state service,” Avakov blogged, calling Kikhtenko a “collaborationist” and demanded he be fired by President Petro Poroshenko.